Aidance Scientific announced the launch of Terrasil Shingles Skincare Ointment, a new over-the-counter treatment to cool and calm highly sensitive skin in patients of all ages. 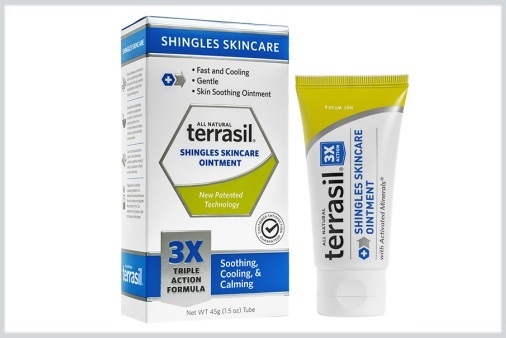 Terrasil Shingles Skincare Ointment is a Triple Action formula that combines all-natural ingredients with patented Activated Minerals technology. Key ingredients include: jojoba oil, which acts by soothing and softening the skin; peppermint oil, which acts by cooling and cleansing; beeswax, which nourishes and moisturizes; and bentonite, minerals which absorb the impurities that may damage the skin. Other ingredients include silver oxide, magnesium oxide, and zinc oxide. RELATED: Are Higher Doses of Shingles Tx Safe for Older Patients? Terrasil Shingles Skincare Ointment is supplied as 45g (1.5oz) tubes only available at Walgreens stores. For more information call (401) 432-7750 or visit ShinglesSkincare.com.